Aaron Bollinger of Lawrence County was presented with the Caregiver of the Year Award. Pictured are, left to right, Vicki Woyan with the Caregiver Support Program at the AAA7; AAA7 Executive Director Pam Matura, Bollinger; and Vicki Abdella, Director of Community Programs at the AAA7. Pictured front row, left to right, Carole Alder, Ohio University; Charles Gorman, Southern State Community College; Gary Fenderbosch, AAA7 Board of Trustees President; and State Representative Doug Green. Second row, left to right, Megan Brown, Shawnee State University; Joy Shytle, Ohio University Southern; Kaci Compton, Field Representative for US Congressman Brad Wenstrup; Juli Stephens, Field Representative for US Congressman Bill Johnson; and Pam Matura, AAA7 Executive Director. Back row, left to right, Ginny Pinson, Department of Business Administration Health Care Administration at Shawnee State University; Eliza Harper, Ohio University School of Nursing; Leeann Denning, Shawnee State University Department of Nursing; and Paul Dovyak, University of Rio Grande Social Work Program. Front row, left to right, Lois Lemley; Mary Book with the AAA7 Ombudsman Program; and State Representative Doug Green. Second row, left to right, Kaci Compton, Field Representative for US Congressman Brad Wenstrup; Debbie Collier with the AAA7 Ombudsman Program; Dena Morris; Lavon Shields; and Pam Matura, AAA7 Executive Director. Back row, left to right, Juli Stephens, Field Representative for US Congressman Bill Johnson, Rex Sanders, Kaye Inoshita and Cindy Oakes with the AAA7 Ombudsman Department; and Gary Fenderbosch, AAA7 Board of Trustees President. 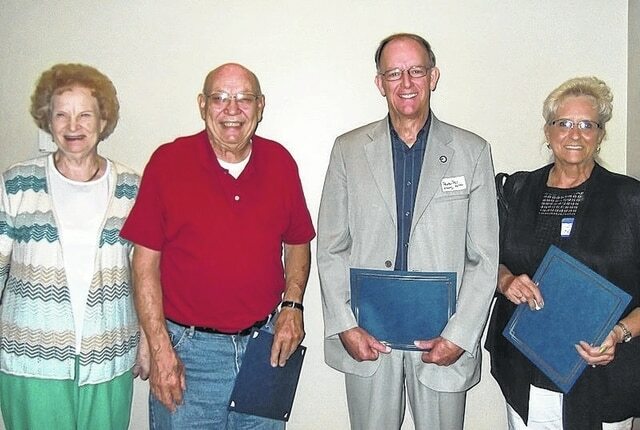 Outstanding Seniors selected by their county Senior Center who were in attendance included, pictured front row, left to right, Lorene Plybon (Sybene-Chesapeake Senior Center in Lawrence County), Richard Rundels (Pike County); Pastor Phil Fulton (Adams County); and Betty Hougland (Ross County). Giving thanks. That was common place at this year’s Area Agency on Aging District 7 (AAA7) Annual Appreciation Brunch, which was recently held at the Southern Ohio Medical Center Friends Center in Portsmouth. During the special event, several individuals and groups throughout the Agency’s 10-county district were recognized for their service and dedication to not only the Agency as a whole, but more importantly, the communities and seniors served by the Agency. The Area Agency on Aging District 7 serves the following counties: Adams, Brown, Gallia, Highland, Jackson, Lawrence, Pike, Ross, Scioto and Vinton. This year’s Area Agency on Aging District 7 “William A. Jenkins Award” was presented to Jane Taylor, Past State Director of the Ohio AARP, who recently retired. The AAA7 presents the award annually to an outstanding contributor to the southern Ohio aging network. The announcement of the recipient of the award is kept secret until the day of the Appreciation Brunch. The award is named in memory of William A. Jenkins, a native of Gallia County, who helped build the aging network in southern Ohio through the Area Agency on Aging District 7. Taylor, who in the past has also been the Executive Director of the Ohio Association of Area Agencies on Aging, as well as Director of the Central Ohio Area Agency on Aging in Columbus, has been an individual the AAA7 has enjoyed working with in a variety of capacities for many years. During the award presentation, Pam Matura, Executive Director of the AAA7, acknowledged Taylor for the significant impact she made during her career throughout the aging network, not only in our local district and the state of Ohio, but also her contributions to providing input and change on a national level. The Area Agency on Aging District 7 “Intergenerational Educator of the Year Award” was presented to nine (9) local university/college programs that, over the years, have assisted the AAA7 with student placements in order to enrich the learning experience for their students and give them a real life work environment. The AAA7 appreciates the opportunity this provides not only for the student, but the fresh perspectives and fresh ideas and resources gleaned from the students. The universities/colleges that were recognized included: Ohio University Social Work Program in Athens, Ohio University Chillicothe Campus Social Work Program, Ohio University Southern Campus in Ironton Social Work Program, Ohio University Nursing in Athens, Shawnee State University Department of Nursing in Portsmouth, Shawnee State University Department of Business Administration Health Care Administration in Portsmouth, University of Rio Grande Social Work Program in Rio Grande, Southern State Community College Human and Social Services in Hillsboro, and Morehead State University at Ashland Social Work Program in Kentucky. This year’s Area Agency on Aging District 7 “Partnership Award” was presented to the University of Rio Grande Esther Allen Greer Museum for their wonderful work with the AAA7 during the annual Senior Citizens Art Show and Poetry/Essay Contest that is held during May and June each year on the campus of the University of Rio Grande. Staff at the Museum have been a huge supporter and friend of the event for many years, providing use of the Museum for the actual hanging and preparation of the Art Show, as well as the two weeks the art is exhibited and the closing Meet the Artists Tea that is attended by artists, guests, and the community. The AAA7 Senior Citizens Art Show, which began in 1982, has grown over the years and during this time, the University of Rio Grande has been a steady supporter and partner. Their continued assistance has been a vital asset to the success of the event, which is a favorite among many seniors in the district. The Caregiver of the Year Award was presented to Aaron Bollinger of Lawrence County. A Gallup survey in November 2012 found 72 percent of caregivers were caring for a parent, step-parent, mother in-law or father in-law, with 50 percent of these caregivers being employed full-time. Working caregivers often must rearrange their work schedules, decrease their work hours, or take unpaid leave to care for their loved ones. The Caregiver Support Program at the Area Agency on Aging District 7 (AAA7) was created in 2001 through Older Americans Act funding to assist informal caregivers with information about caring for themselves and their loved ones, providing respite services, and linking caregivers to other needed services. Chelsea Adams, Ronda Bivens, Carol Carter, Daniel Farley, Jeannette Hayburn, JoAnn Hilderbrand, Lois Ann Lemley, Nancy Miley, Dena Morris, Debra Neal, Joan Phillips, Maryellen Pratt, Elizabeth Prayner, Lavon Shields, Gerald Towler and Kathy Wolf-Utter. Cher Belllar, Linda Black, Libby Brisker, Etta Charlebois, Ashley Daniels, Brittany Farley, Cindy Goodman, April Greer, Diane Hewitt, Kim Johnston, Tami Jolly, Joyce Lewis, Colleen McCambridge, Dee Meddock, Marty Newman, Terri Pearson, Susan Pitts, Cathy Shipley, Sandy Shirey, Tracey Smith, Patty Snyder and Sandra Williams. Joan Arrowood, Shelia Arrowood, Kathy Bays, Rita Baker, Clara Borden, Alice Chinn, Jack Chinn, Dennis Crabtree, Penny Crabtree, Ruth Davis, Martha Detty-Foster, Diana Evans, Doris Evans, Phyllis Fulk, Joyce Haag, Mary Johnston, Carolee Lewis, Freda Lowery, Mary Maxson, Rushie McAllister, Annabelle Miller, Maudine Minnis, Pat Parsons, Joan Shasteen, Nancy Shaw, Lavon Shields, Irena Skaggs, Jim Skaggs, Joann Smith, Anna Summers, David Summers and Phyllis Taylor. Adams County – Pastor Phil Fulton; Highland County – Juanita Kelley; Jackson County – Wanda Cross; Lawrence County (Ironton Senior Center) – Doris Roberts; Lawrence County (Sybene-Chesapeake Senior Center) – Lorene Plybon; Pike County – Richard Rundels; and Ross County – Betty Hougland. The Area Agency on Aging District 7 was pleased to host another successful Appreciation Brunch to extend its thankfulness and appreciation to all the individuals and groups who make the district so special.